Emerald ash borer is an invasive parasite that has decimated millions of acres of ash trees across the United States and Europe. Ash trees were once a top seller for nurseries and a staple in urban forests and streetscapes. But thanks to the emerald ash borer (Agrilus planipennis), growers, buyers and specifiers have been forced to seek alternatives to replace the once-dependable workhorse. Over the past 15 years, the voracious beetle from Asia has carved a path of tree destruction across the United States, from the Atlantic coast to Colorado. The toll from the damage is expected to exceed $10 billion, with municipalities, property owners, nursery operators, forest products companies and many others sharing in the cost. Not surprisingly, the impact on ash tree sales has been pronounced. Nancy Buley, director of marketing at J. Frank Schmidt & Son Co., a tree breeder and wholesale grower based in Boring, Oregon, has observed the same impact. “Previously, ash trees accounted for 30 percent of trees shipped nationwide,” she said. The first detection of the emerald ash borer in the United States was in 2002 in southeastern Michigan. Officials believe the pest arrived in wooden pallets or crates that were shipped or flown from Asia. The emerging adults found their way into upper Midwest trees and adjoining provinces in Canada. The initial spread was so slow that it was almost unnoticeable. However, the pest expanded its territory state by state, and it now covers most of the eastern United States. The adult beetles nibble on foliage, causing little damage. However, their young larvae feed on the inner bark of ash trees (Fraxinus spp. ), disrupting the tree’s ability to transport nutrients and water from the root system to stems and foliage. The afflicted trees eventually die. The economic impact EAB has inflicted on large urban spaces and small bedroom communities alike is unrivaled. The true total has yet to be tallied, but researchers at the USDA Northern Research Station have pegged the projected impact at 17 million trees lost and $10.7 billion to treat, remove and replace the afflicted trees. To arrive at those bleak numbers, six USDA researchers simulated the potential spread of EAB on developed land over a 10-year period from 2009–2019. Their study area encompassed more than 38 million ash trees across 25 states. Duly concerned, other researchers have attempted to identify natural enemies of the emerald ash borer that could regulate, if not eliminate, the pest. Unfortunately, such efforts haven’t yielded any viable options. 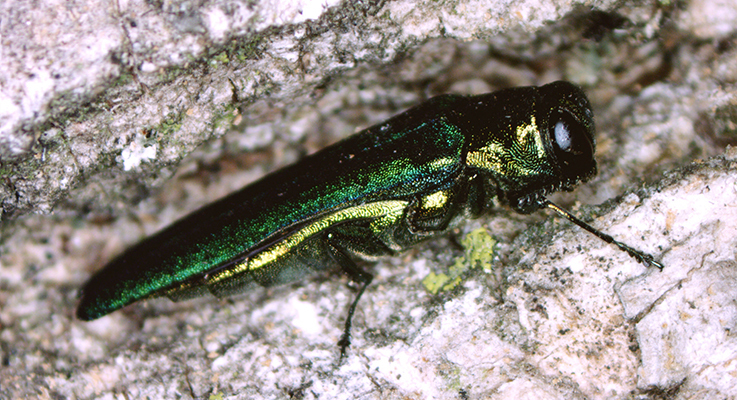 Quarantines have also been put in place to prevent potentially infested ash trees, logs or firewood from spreading outside of areas where EAB has been positively identified. The pest has not yet arrived in Oregon, but officials are watching expectantly. Similar to when Dutch elm disease (DED) struck, cities, retail nurseries and landscape architects once again are forced into replacing a once-dependable standby with something new. In the past, they might have glossed over certain trees when reviewing availabilities. Those trees are now getting second looks. Dr. Bert Cregg is an associate professor of tree physiology at Michigan State University in East Lansing, Michigan, and has seen the effects the pest has had since its arrival in that state. “Urban and community landscapes in Michigan are especially at risk due to heavy losses of ash trees associated with the emerald ash borer outbreak,” he said. Cregg has undertaken research into “Urban Tree Selection in a Changing Climate,” which aims to identify street tree cultivars with the demonstrated capacity to adapt to urban stresses and climate change. He is collaborating with J. Frank Schmidt & Son Co., Greening of Detroit, Nursery Supplies Inc. and Renewed Earth Inc.
Changing buying and planting habits can be aggravating and time consuming when foresters, designers and retail buyers are not familiar with alternative cultivars. Growers across North America are reducing or completely eliminating green, white, black and blue ash trees from their availabilities and inventories. Retailers and landscape professionals are replacing ash trees with a host of other four season and pest-resistant tree species to offer their clients. Oregon nurseries have always been on the forefront of providing education, protection and defending our number one agricultural export. • Autumn Fest® Maple (Acer saccharum ‘JFSKW8’) PP 22034 — Dark green foliage turns brilliant red-orange colors in early fall. Vigorous and faster growing with strong, upright and oval growth habit and symmetrical branch structure. Prefers full sun to partial sun/shade. Does well in average to dry, well-drained soils. Moderate growth rate, maturing at 50 feet by 35 feet. Hardy in zone 4. • Kentucky Coffee Tree (Gymnocladus dioicus) — Graceful, upright-growing oval-shaped, medium tree with an open, airy canopy. Arching branches unfurl large fans of bipinnate, compound leaves suggesting a tropical climate. Both grass and flowers flourish beneath an open leaf canopy. North American native tree. 2006 winner of The Society of Municipal Arborists Tree of the Year award. Prefers full sun. Adaptable to a wide range of growing conditions including alkaline soils, drought, heat, cold, salt, insects and disease. Slow to moderate growth rate, maturing at 60–75 feet by 40–50 feet. Flowers from May–June. Hardy in zones 3–8. • Redmond Linden (Tilia Americana ‘Redmond’) — Formal, sturdy and easy care tree native to North America. Prefers average, well-drained soils in full sun to part shade. Tolerates some drought and clay soils. 2000 winner of The Society of Municipal Arborists Tree of the Year award. Moderate growth rate, maturing at 50–70 feet by 30–45 feet. Flowers in June with small, pale yellow and fragrant flowers. Hardy in zones 2–8. If there is a silver lining from the ravages of EAB, it has resulted in increased tree diversity in the urban landscape. Through continuing research and education efforts growers, foresters and researchers are fanning the EAB flames in the opposite direction. With a coordinated, on-going educational effort, the tree industry and its customers will rise from the ashes once more. What we as a horticultural community do about it will make a world of difference in the short and long term health of our urban forests, street trees and landscapes. For more information, contact your state extension office, arborist association, university or state nursery association for more EAB details specific to your area. Get educated. For the latest informa-tion, visit www.emeraldashborer.info. Create educational materials for your customers, designers, retailers and homeowners. Update your head growers and field teams with the latest EAB news. Make sure they are looking for signs of damage and reporting findings to management and/or state extension offices for EAB movement patterns.